Our own Derek Pringle (D.R. 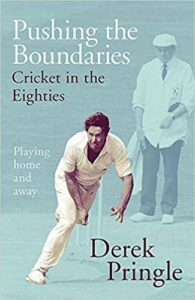 Pringle, Felsted & Fitzwilliam, 1979-81) has recently published a new book and I mention it here as it is good. I am usually wary of books as they can often be a bit complicated, this one is a cracker. It is easy on the eye, writing is not too small, not too many obscure statistics, nice pictures, good stories and generally int eresting, entertaining and very well written. It’s also a bit of a bargain.